Vito Vincent wasn’t always loved. He was surrendered by his family and found himself awaiting adoption at Bideawee in NYC. 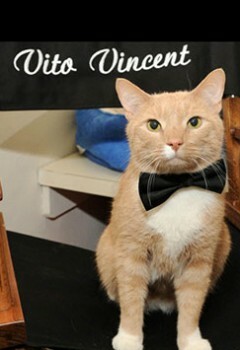 Since his adoption though, Vito Vincent has become a real star, appearing on Thirty Rock, Colbert Nation, and starring on Broadway in Breakfast at Tiffany’s with Emilia Clarke from Game of Thrones. Vito Vincent is fully trained, and his calm personality allows him to work with even the highest intensity productions and individuals. Most recently he performed on the Tonight Show starring Jimmy Fallon as Purrnie Sanders and on the Late Show with Stephen Colbert as Tuxedo Cat. And Vito Vincent appeared in a short movie called “Happy Birthday Marsha!” which was released in 2018.